Hey, so I hear there’s a holiday coming up! Though Halloween is not a big deal in our house, I am looking forward to next year when the baby will be able to walk and we can dress him in something extra cute. 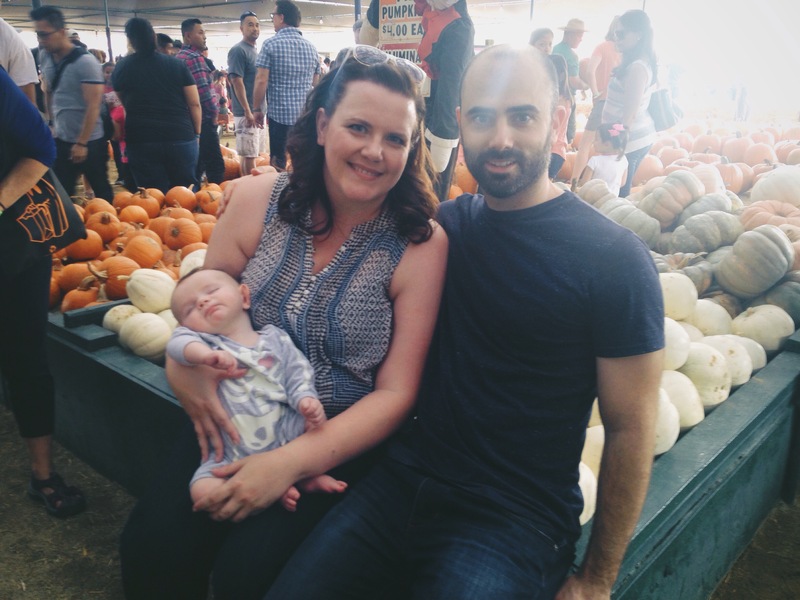 This year we had to settle for a visit to a pumpkin patch and a corn maze. By the way, if you are going to a corn maze with a baby, don’t forget to bring the Ergo. They didn’t allow our stroller, so Matt had to carry him the entire time. At least being held for that long seemed to really wear him out. See? At the pumpkin patch they also had a farmer’s market, and my husband really, really wanted to get something. We decided on tomatoes. He said “hey, they only sell bags for $8. Do you think we could use a whole bag of tomatoes?” While he was asking me I was looking at a different “bag” and said “Sure!” Little did I know that bag included something like 30 tomatoes. Yep, time to get to cookin! The recipe I found seemed easy enough, it called for 10-12 tomatoes, and I have an immersion blender, so I thought I would give it a try! Not so fast. The recipe called for Roma tomatoes and I had whatever these were (heirloom? ), and the first step was to remove all the seeds. That definitely took a while. Not sure if it would take less time with Roma tomatoes, but just know, getting rid of seeds in tomatoes is not the easiest thing. After the laborious first part, the recipe came together rather quickly. I’ve been committed to making challah every week, and we had a loaf lying around. It made a perfect grilled cheese sandwich, which is the natural pairing for tomato soup. Want to know my trick to the perfect grilled cheese sandwich? Instead of buttering the outside of the bread, use mayo. It will be much crispier. Want to save this for your next rainy day? Pin this pic! Recipe adapted from Joyful Healthy Eats. 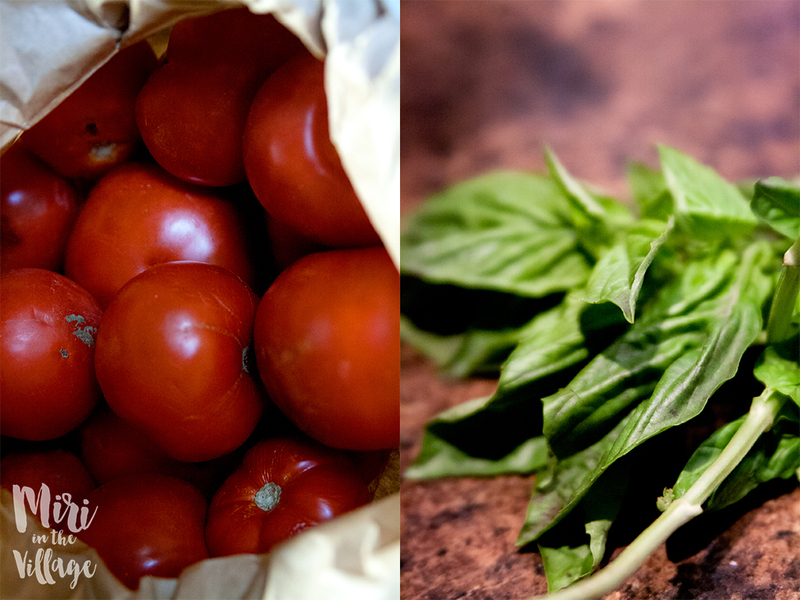 Sprinkle tomatoes with olive oil and season with salt. 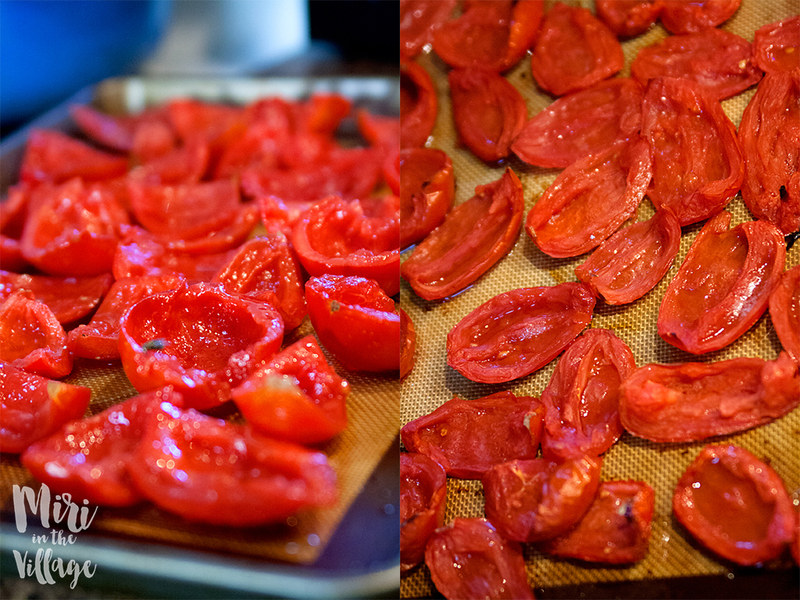 Roast tomatoes for 40 minutes. In a 6-quart stockpot over medium high heat, add vegetable oil, onions and crushed red pepper. Sauté onions until translucent (about 5-7 minutes). Add garlic, stir for 30 seconds and add crushed tomatoes, vegetable broth, and sun-dried tomatoes. Bring to a boil, then add roasted tomatoes and let simmer for 10 minutes. Add basil and cream cheese to pot and stir until the cream cheese is completely melted. Ohhh yum that looks good and will def have to try mayo instead of butter! 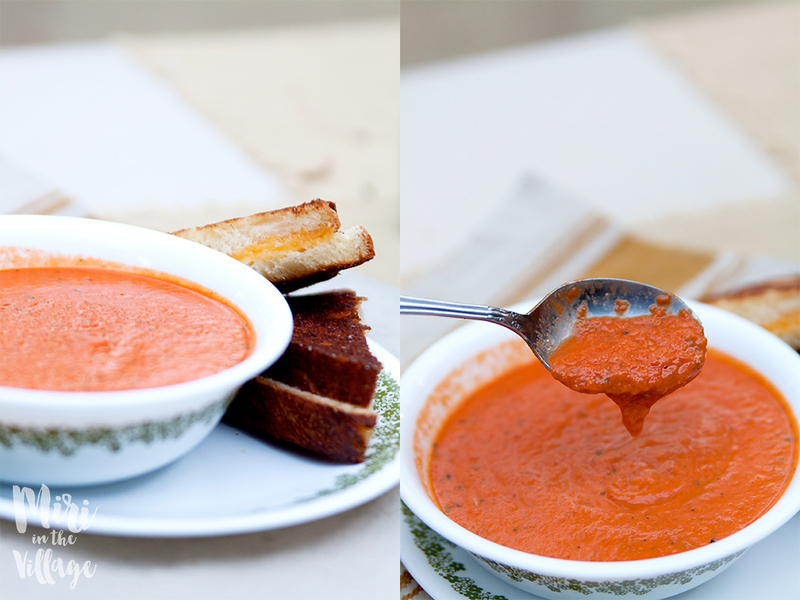 I love love love tomato soup. My recipe is very similar to yours, though cream cheese is an addtion I haven’t tried. I will soon! This looks delicious! Pining for later. One of my all time favorites 🙂 So warm and yummy and comforting! This looks delicious and perfect for the upcoming season! Looks so yummy Miri! 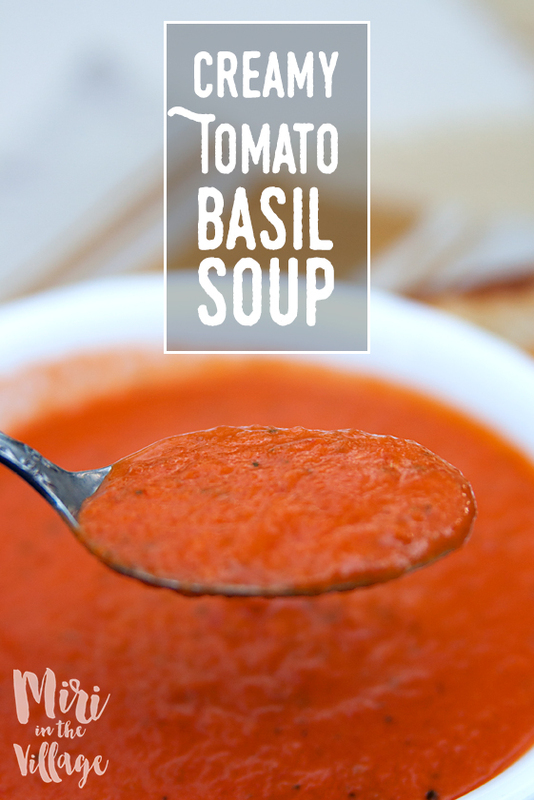 I love homemade tomato soup. So much more delish than canned stuff! The Big Boy Bed Transition and a HUGE Announcement from the Nadlers! Courtesan Au Chocolat – Make it at Home!